Scuppers (drains) on Flat Roofs are prone to leakage. The pictures below show some common problems with flat roof cool coated scuppers. Scupper in Good Shape. And pretty rare. Smooth Stucco Crack. Smooth stucco is prone to cracking. Corners on windows, doors and scuppers are prone to cracking. Combine the two of them and its almost a gurantee there will we cracking in the corners of smooth stucco scuppers. The problem with these is if its an area where people can see it, the repair will scar and be ugly. The only way to lower the visibality of the patches and caulk is to pain t the wall. The Stucco Patching section of this web site has quite a bit of information on this topic. Leaking Around Scupper. A building maintenance man did some roof coating and in general did a pretty good job. He apparently didn’t know to seal up the outside of the scupper too. When I get a call about a leak only occasionally happening during a rain this usually means the hole is up a few centimeters off of the flat portion of the roof. Cannon Scuppers. 10 out of 10 on the difficulty scale. “Cannon Scupper” is our term for them. It means a long scupper and you can’t get your hand into it. In this case the leak is at the end which is good. 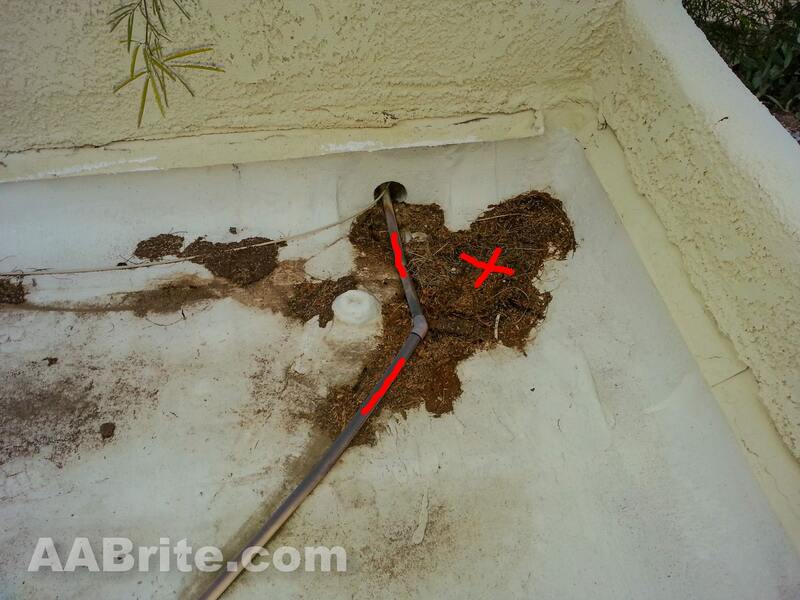 The area marked in red needs to be caulked. The water us running back up the clay pipe after exiting the metal insert. Holes Inside Scupper. Fairly common problem. All of the different materials; plywood, tin, tar paper, tar, cool coating and fiber tape are each expanding and contracting at different speeds with the daily heat cycle. Eventually gasses in the tar work their way out and now there’s a leak. Gutter Boxes. Another one with an above average difficulty level. The caulk has probably failed under neath the scupper and the water is running into the wall. If this is the case the only way to get to them is to take off the gutter box. The adobe frequently falls apart when this happens and makes for more work. Another way of saying this is we have to charge more to repair these since they take longer than most other repairs. Wall Leak. This is not a roof leak or a scupper leak, the crack is near the srupper and water is coming in through the wall. Leak at Base of Scupper. Common problem. In this case gas bubbles came out of tar and now water can get it. Cracks around Scupper. Common problem. Caused by heat cycles and age. Small Elevated Hole at Scupper. This will leak with big rains but not small ones since the water level only gets up to the leak during big rains. Mesh Lifting. The patching mesh was not sufficiently coated with roof coating and water can get in under it. Debris At Scupper. The debris hasn’t turned into a problem yet. 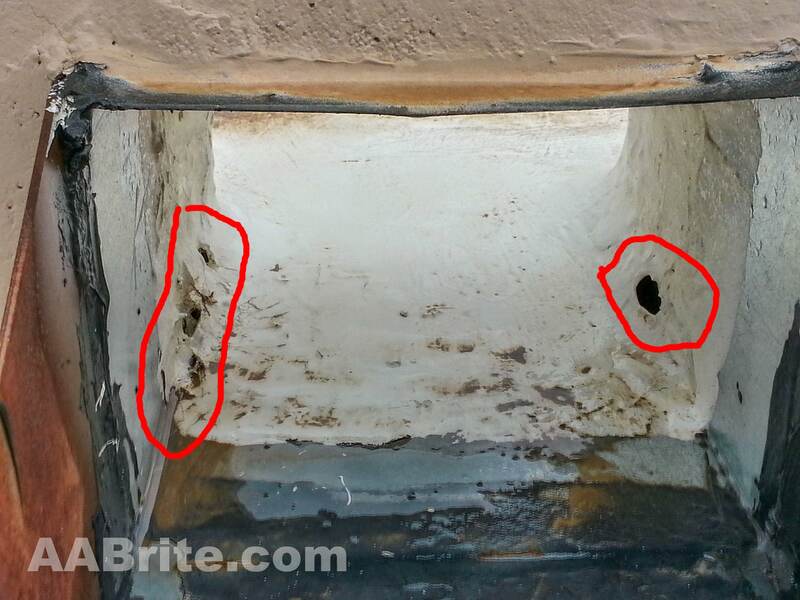 Sometimes debris clogging the scupper causes huge problems. More frequently it causes accelerated aging at the scupper since the leaves and dirt hold water. The roof coating needs to dry out between rains or it gets soft and quits working – like skin that’s been in the bath tub too long. Pond At Scupper. This pond is actually “great” by Tucson standards. If they are small – say a square foot or so, they can dry out between rains. If they get bigger then they hold the water too long and make problems. Scupper WAY To Small. Not much can be done with these. Depending on the build of the house, the wall / roof can be cut open and a larger scupper installed. This is outside our scope of work. Stuff Inside Scupper. Grr. Most all building trades have something other trades do that’s wrong and irritating. Here’s an example. Scuppers were not meant to be doors ways for cables and pipes. Now that its done, the correct way to do roof work around this pipe is to cut it off, do the roof work, and then have the AC guys reinstall it after the roof work is complete and cured out. Most homeowners just want us to work around it. We can, but since the pipe is sitting in our material it knocks the longevity of the new coating down some.